‘Green bicycle’ or #SWEDOW? | Wait... What? They begin discussing: How are these bicycles really green? How much are they paying to ship them over to Kenya? This is not even the right model of bicycle. These are not the Black Mamba bicycles like we are used to — these bicycles will not stand up to Kenyan roads. And you won’t find the spare parts here either. We are not short of bicycles here in Kenya. Why not purchase them locally? Why are they shipping in refurbished bicycles? I tell them about 1millionshirts (an idea to send a ton of used t-shirts to ‘Africa’ that was subsequently taken through the wringer) and SWEDOW (Stuff We Don’t Want — a term made famous by @talesfromthhood to represent the idea of sending unwanted junk to ‘developing countries’ and feeling good about it). We go back to the article to see what the details are, to see what exactly is it that makes the bicycles ‘green’? After all, ‘green bicycle’ is in quotes in the headline, so maybe the article’s author is also questioning the real ‘greenness’ of these bicycles. We read that the project is the brainchild of Kenyan Isaac Kalua, who runs the Green Africa Foundation. He visited Tokyo a few years ago and met Hiroshi Kurokawa, the Chairman of the Japan Bicycle Foundation, and the idea was born. “The organisation [Japan Bicycle Foundation] receives bicycle donations from wealthy Japanese, refurbishes them and ships them to other Asian countries to help rural people reach school and healthcare centres…. On average, each refurbished bicycle costs Sh12,000, including the cost of shipment.” Kalua was able to convince Kurokawa to ship some to Kenya also. So, if my calculation is correct, 12,000 Kenyan Shillings is around $150. (This June, 2009, blogpost called “Wanna buy a Kenyan bike” [complete with great photos] details the features that a good bike should have for the Kenyan context, and says that a new one can be purchased in Kenya for $75). 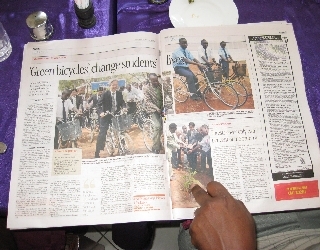 The article explains that in return for receiving a bicycle, “beneficiaries have to plant trees in their homes and schools and also encourage their communities to do so.” The Japanese ambassador to Kenya says “this is an innovative way to get people to plant trees.” He also says that he looks forward to the day that there will be more Japanese bicycles than Japanese cars on the roads of Kenya. Greening Africa. Bike riding in Kenya. Tree planting. Recycling/re-using Japanese bicycles. Good ideas, but I bet there is a better, more sustainable, and more cost-effective way to achieve those aims than shipping refurbished bicycles from Japan to Kenya. Another great post in a series of good ones this month. One of the things I don’t like about the snarky SWEDOW flowchart is the need for innovation in how we handle materials in our current economy. The author prides themselves on being better than clueless donors, but doesn’t raises questions of recycling and re-use. William McDonough in Cradle to Cradle: Remaking the Way We Make Things, talks about this. It’s too bad the Japanese Ambassador doesn’t look forward to the day that there are more bikes than cars used daily in Japan. Given oil scarcity, that day is coming– it’s just a question of when and how smooth the transition will be. I like your last paragraph, which focused on goals– it reminded me of Amory Lovins’ remark (years before he began collaborating with McDonough) to think in terms of systems and goals- People didn’t want nuclear power, he pointed out; they wanted warm showers and cold beers. If there was an alternative means to get them those goals, they wouldn’t even notice. Thanks for the links. I totally agree that those of us living in countries that over consume need to rethink consumption before anything else. Nice point also in your last 2 paragraphs. I was also thinking about those things. Why not a campaign to convince Japanese to use more bicycles and to use their own bicycles longer by repairing them? on July 24, 2010 at 7:17 pm | Reply J. Great post, Linda. Another wonderful example of #SWEDOW, really, in the true sense of the term. It seems clear enough that over and above everything else, this project is about BICYCLES. The BICYCLES come first. What’s really the best way to help “green (v.) Africa” or provide Kenyans with locally appropriate bicycles? These considerations are apparently secondary.